You are here: Home / Shop / Gifts for Tea Lovers / Libre Loose Leaf Tea Glass Review: Loose Leaf Tea on the Go! 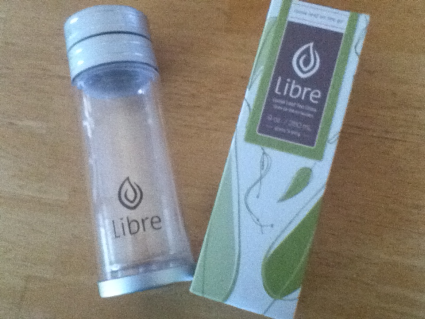 Libre Loose Leaf Tea Glass Review: Loose Leaf Tea on the Go! You’ll use this gorgeous infuser/travel tea glass (it’s simply too classy to refer to as a mug) daily as I do. Not only is this little beauty perfect for taking with you (whether you fancy iced tea or hot), it’s just as convenient to use at home! It makes brewing and enjoying loose leaf tea as convenient, easy, and delicious as other methods. The design is as beautiful and classy as any tea lover could hope for. The glass fits perfectly into your vehicle’s drink holder. The glass even fits in your purse! Maybe best of all, the Libre Loose Leaf Tea Glass has a glass interior, meaning you’ll enjoy tea the way it was meant to be enjoyed: Fresh, wholesome goodness untouched by plastic of any kind. I’ve never (as in not even once) had a problem with leaking. This may sound pretentious and it may hit at tea snobbery, but I love that it looks so highbrow and classy. Wherever you go, people will want to know where you got this beautiful tea glass to go. I could go on and on about how beautiful, convenient, and first class this product is, but I honestly think this would be a great time to encourage you to visit Libre’s Online Shop. You’ll find a wealth of information, images, close-ups, and even videos. While there, be sure to visit the main website as well – it’s a great, fun place for tea lovers to feed their passion. I was wondering about this Libre tea glass holds up. From what you’ve said, it sounds like a great tea investment. I’m excited to expand my loose tea experience with this travel glass. Thanks!